I often wonder if they asked each other “How many rings does YOUR purse have?” That may have not been the exact approach that Medieval people took, but purses were definitely an important display item. The “typical” purse frame that I have shown you is definitely common, but it is by no means the only form that we find. One frame ring, two frame rings, three frame rings and simple wire rings are all found. The majority of the frames are made by casting, and are composed of some sort of bronze alloy or iron. Let’s take a look at a two ring frame. This is a drawing of a purse that belongs to the British Museum. A quick glance will show that this is a small purse, probably used for coins. It is only about 5 cm (a little less than 2 inches) across at the support bar. The much larger, roundish purse frame rings allow a person to at least put their fingers into the purse to grab a coin, probably while pushing up the purse from the bottom with the other hand. This is a particularly excellent example of a nicely built purse frame, Because amount of detail that they included in the drawing we can really see how the frame works. 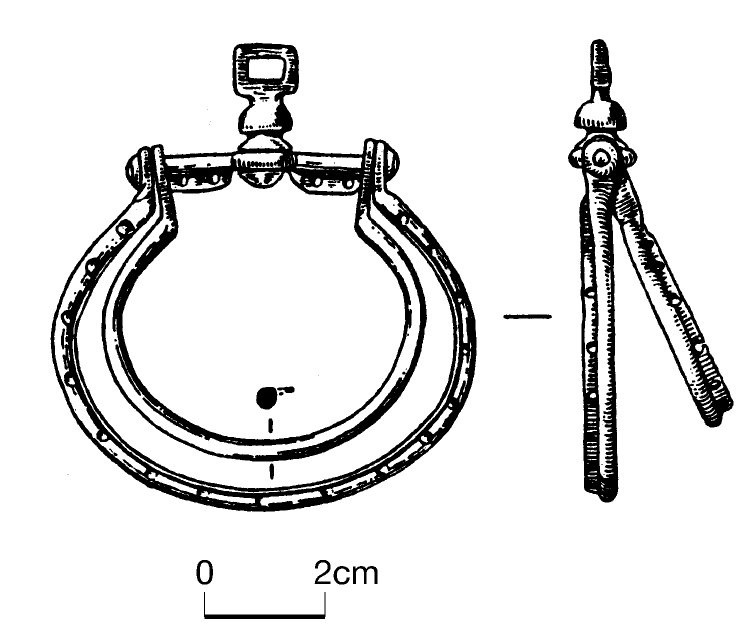 The drawing shows the lip that was cast on the purse frame ring to attach the bag of the purse. The Museum of London has a purse frame of similar form that has had a modern velvet bag sewn onto it. If you go to the link you can see how the larger purse frame ring forms the cover for the purse, and the smaller ring, along with the two support tabs on the purse bar actually support the bag portion of the purse. This particular purse bag shows the purse frame loops almost completely covered by the fabric of the purse. There is no way to determine exactly the form of the original purse rings, because you can’t see them. The frame rings may not have had the pierced lip that allows the metal frame ring to support the purse bag while still showing off the metal of the frame. There is both a front and back version of the purse picture, which is great because it allows you to actually see all of the details of the frame, the velvet purse bag, and the way it was attached. There are a considerable number of other types of metal purse frames, including some that are truly odd, and some that are totally over the top. This entry was posted in Leather Purse or Belt Pouch With Brass Frame, Metal Casting, Metal Working, SCA Life and tagged Medieval purse, Medieval purses, Metal purse frame by Eirny. Bookmark the permalink.